For the next hundred years, life was quite settled. A market was held every Friday and a fair on May Day. Another fair was thrown mid October. Research has even shown that taxes were collected at the Pykkerel Inn, which has kept its name to date and still sits on the High Street. During this time Ixworth’s growth and prosperity made it the best known and arguably the most important village in the area. In 1537, the monastery was dissolved and the Priory Church was destroyed. Stones from the building were sold and are now in Redgrave Hall while its lead makes up the roof on Hengrave Hall. The remaining priory buildings, which make up ‘the abbey’, are the oldest surviving buildings in the village. In the 1530’s, the Crown gave the land on which the abbey stands and all of the surrounding lands of the manor to Richard and Elizabeth Coddington in exchange for their land in Surrey. This family soon came to love Ixworth, setting up a charity that still helps people today. Their tomb can still be seen inside the Parish Church today. In the mid-seventeenth century, the Norton-Cartwright family owned the manor. The population of Ixworth in 1700 was almost 1000 and it remained at a similar level for quite a while. 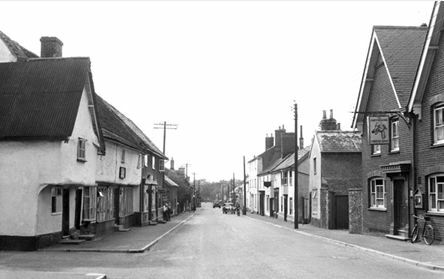 Due to its stable population and prosperous farming, Ixworth was considered to be a small town during this time. White’s Suffolk Directory, in 1884, refers to Ixworth as ‘well-built and pleasantly situated’.